We previously covered Kate Middleton’s British chic, however, in today’s post we cross the pond and cover the iconic American chic of Lauren Hutton. Classic, timeless, approachable, and effortless style…much like the iconic model and actress. So, what does it take to dress like Lauren Hutton? When you think of Lauren Hutton’s style, think of the best of 70’s glamour toned down with bohemian charm. She is a high quality silk blouse paired with casual, non-pretentious white tennis shoes kind of girl. Her hair is solidly unfussy, while she wears a blue silk suit from head to toe. Hutton’s style is built for luxury while forging a juxtaposition with effortless comfort. 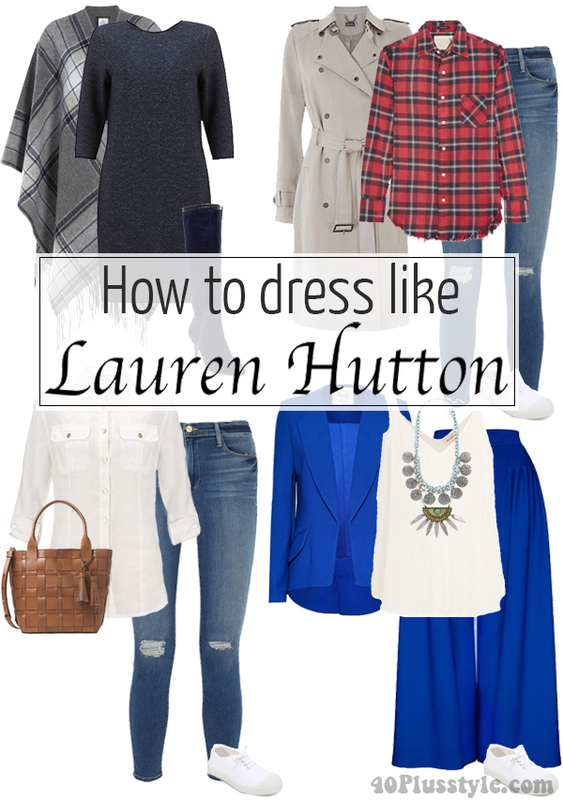 Take a look at some of the Hutton’s looks here, and give yourself a dose of classic American (and chic) style with our guide on how to dress like Lauren Hutton below. There is a tomboy like quality to Lauren Hutton’s tops. From plaid shirts to luxe silk blouses, Hutton takes a comfortable approach to her styling. When you think of the quintessential wide-leg trouser that is both well tailored and flowing, Hutton’s signature look comes to mind. From the 70’s to the present, she has created an iconic look out of the wide leg trousers. However, tapping into her ability to add relaxed style to her looks, Hutton also selects cuffed khaki pants and distressed jeans that compliment a well-lived in look. First thought that comes to mind when you think of Hutton’s outerwear options, are the eponymous trench coat (wear it loosely) and the safari jacket that has been part of her wardrobe identity since the 60s/70s. In the present, she also harkens back to 70’s glamour with luxe wool dresses paired with dramatic wool capes that are as understatedly glamorous as they are comfortable–two key components of her style. As mentioned above, Lauren Hutton’s style is defined by well-fitting and high quality tailored blazers. Think of luxe materials and figure flattering blazers (with the occasional loose fitting gem), that instantly pull the look together and add a unique edge. She is especially known for selecting monochromatic looks with blazers as the foundation that look anything but stuffy or overdone. Known for her increasingly iconic white tennis sneakers, Hutton’s approach to shoes is mostly on the comfortable side. This includes textured and graphic Converse high-tops, pointed toe flats, and high quality brogues. Continuously channeling elements of 70’s glamour, Hutton has been known to include knee high suede boots and metallic sandals in her styling as well. 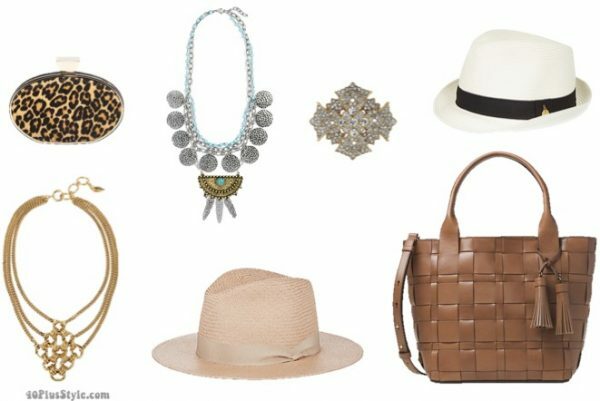 From her iconic panama hats to leopard print clutches that harken back to her famous photos from the 70’s, Lauren Hutton’s accessories find balance between being both overtly glamorous and easy going. Gold brooches worn with relaxed blazers, statement necklaces paired with broken in plaid tops, and panama hats paired with silk wide leg trousers all define her style. The contrasts she creates through her accessories selections all translate into her unique style we adore. Are you a fan of Lauren Hutton’s style? Lauren Hutton is one of my style icons. She has a classic, effortless style which is timeless. Thanks Sylvia! Your link takes us to Kate Middleton. Classic styles are, and will always pave the road for new and trendy style ideas, and Lauren Hutton is a perfect example of the “face” of classic style. I ran into Ms. Hutton in NYC a couple of years ago. Still effortless and timeless. Lovely classic! 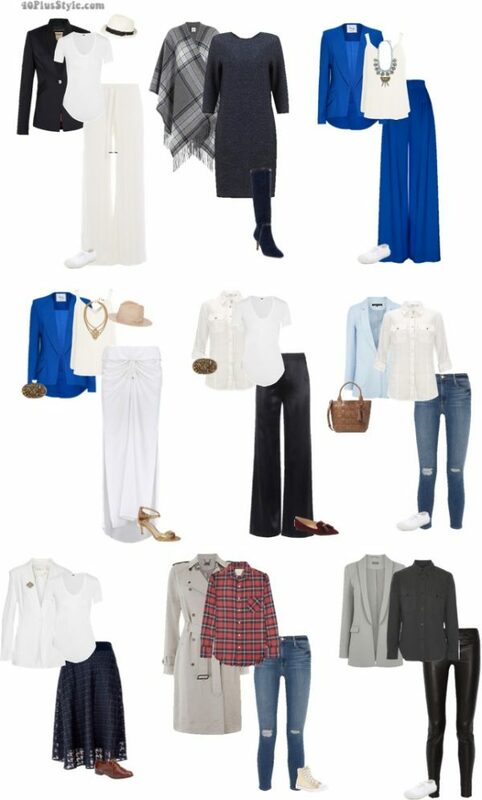 Next post: Streetstyle inspiration: 3 wide legged pants outfits – which is your favorite?